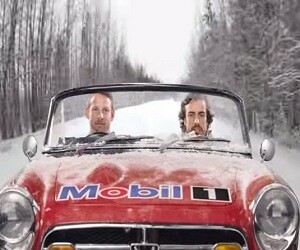 The “Endless Roadtrip” advertising campaign for Mobil 1 motor oil features the McLaren-Honda drivers Jenson Button and Fernando Alonso gearing up also for a race in Sochi. The two Formula 1 champions travel in a convertible, with Button at the steering wheel. “I think it’s time to pull over the car”, says Alonso. “Please. I cannot feel my face”, he adds. “Nonsense. Fresh air is good for the lungs”, answers Button. “It’s cold here”, adds Alonso. Button smiles, giving no sign that he intends to pull over. The 30-second spot ends with the image of a bear in the snow and the text “A lot can happen between oil changes”.